जिशा, मेरी दोस्त मेरी यार, क्या कहूँ यार तुम्हारे साथ जो दंविये बर्बरता हुई उसके लिए मुझे शब्द नहीं मिल रहे हैं कुछ कहने को. ये देश ये समाज हर रोज़ ऐसे झटके देता रहता है और इतना देता है, इतना देता है, की हमारे लिए वीभत्स से वीभत्स घटना क्रूरतम से क्रूरतम घटना साधरण बन गई है और इन घटनाओं को पचाने की क्षमता में भी हम माहीर हो गए है. देखो न दोस्त, असाधारण कहाँ कुछ रह गया है. बचपन से आज तक तो यही सब देख- देख कर पले बढे हैं हम सब की, जो कुछ हो अपना हक़ मत मांगना, पढने लिखने की बात मत करना , बाप या भाई लात घूंसे मार- मार कर तुम्हे अधमरा कर दे लेकिन एक शब्द भी उनके खिलाफ बोलने की गुस्ताखी मत करना, गाँव के उच्च जाति वर्ग के सामंती तुम्हे अगर छेड़े तुम्हारा बलात्कार करे तो उसका बहिष्कार मत करना कियोंकि ये तो उनका जन्म सिद्ध अधिकार है. तुम्हारे लिए जो लक्ष्मण रेखा खिंची गई है उससे बाहर जाने की कोशिश की तो तुम्हारी शामत आना पक्की है. और शादी? ये तो दूसरी जात में तो दूर की बात अपनी जाति में भी करने का अधिकार या आजादी की बात मत करना ये तय करना घर के बड़े पुरुषों के कंधे पर छोड़ो. सती सावित्री बनो, एक सद्गुणी बेटी, बहु और पत्नी बनो इसी में तुम्हारी भलाई है. How many murdered Dalits does it take to wake up a nation? Ten? A thousand? A hundred thousand? We’re still counting, as Anand Patwardhan shows in his path-breaking film Jai Bhim Comrade (2011). Not only are we counting, but we’re counting cynically, calculating, dissembling, worried that we may accidentally dole out more than ‘they’ deserve. So we calibrate our sympathy, our policies and our justice mechanisms just so. So that the upper caste killers of Bhaiyyalal Bhotmange’s family get life imprisonment for parading Priyanka Bhotmange naked before killing her, her brother and other members of the family in Khairlanji village in Maharashtra, but the court finds no evidence that this may be a crime of hatred – a ‘caste atrocity’ as it is termed in India. 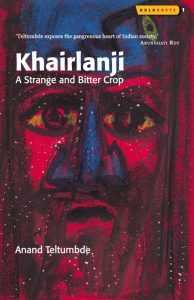 Patwardhan’s film documents the twisted tale of Khairlanji briefly before moving to a Maratha rally in Mumbai, where pumped-up youths, high on testosterone and the bloody miracle of their upper caste birth are dancing on the streets, brandishing cardboard swords and demanding job reservations (the film effectively demolishes the myth that caste consciousness and caste mobilisation are only practised by the so-called ‘lower castes’). Asked on camera about the Khairlanji murders, one Maratha manoos suspends his cheering to offer an explanation. That girl’s character was so loose, he says, that the entire village decided to teach her a lesson.